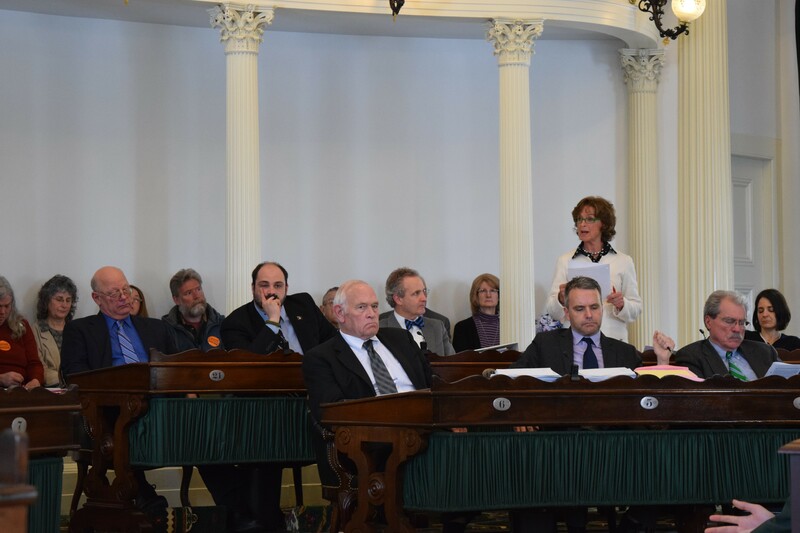 Sen. Claire Ayer (D-Addison) speaks Wednesday in support of Vermont's end-of-life law on the Senate floor. Opponents of Vermont’s nearly two-year-old end-of-life law fell short Wednesday in what was likely their best chance to repeal the controversial policy. The Senate voted 18-12 against repealing the law, which allows terminally ill patients to seek a lethal dose of medication to hasten their own deaths. “This is about the state saying, 'We think it’s OK for you to commit suicide,'" said Sen. Peg Flory (R-Rutland), who argued on the Senate floor for repealing the law. "I think it's a bad policy." Sen. Claire Ayer (D-Addison) defended the law as something other than suicide. “I think that suicide and choosing to control the time and the manner of death when you’re already dying are completely different things," she said. In 2013, the law was approved by a narrow margin after a lengthy and contentious debate. Opponents, who worry some people could be pressured into using the law to avoid becoming a burden, hope to repeal it this year. Their best chance appeared to be in the Senate, where the 2013 vote was closest. “We thought we had a good shot,” said Guy Page, an opponent who represents the Vermont Alliance for Ethical Health Care. He said he’ll continue to seek repeal, or at least to delay a vote until next year in the House. Senators voted Wednesday to tweak the law to keep in place requirements that are due to expire next year. Those include protocols intended to ensure a patient is making a voluntary, informed decision. Ayer said she considers it particularly important that patients be required to get a second opinion and abide by a required waiting period. Sen. Kevin Mullin (R-Rutland) tried unsuccessfully to delay action on reinstating the expiring requirements until next year. Lawmakers would have more information by then about how the law is working, he contended. Ayer countered that she didn't want the change to get caught in the "end-of-biennium swirl." Seven prescriptions have been written since the law took effect in May 2013, according to the state Department of Health. Doctors must report to the state when they write a prescription, but there is no reporting required on whether a patient uses the drugs. Advocates for the law say three patients have used the prescriptions. Ayer read a letter from Kim Kurak, whose husband, Jason Saltman, was the first Vermonter to request the lethal dose, as he was dying of stomach cancer. The Middlebury man died in November 2013 before using the drugs. “One of the few comforting things for him was the knowledge that this bill had just been approved,” Ayer read from Kurak’s letter. Sen. Jeanette White (D-Windham) said the law was a comforting option for a constituent of hers, Maggie Lake, who used a prescription to hasten her death in January. “We did not tell her that this is what she should do. This is a choice people should have,” White said. Gov. Peter Shumlin, a longtime supporter of the law and former Windham County neighbor, also cited Lake’s death in defending the law in a news conference Wednesday.